^ Burlingame, Russ. Exclusive: Captain America 3 Directors Talk Villains And Who Is Returning. Comicbook.com. 2014-08-25 [2014-08-26]. （原始内容存档于2014-08-26）. ^ Captain America: Civil War (12A). British Board of Film Classification. 2016-04-18 [2016-04-18]. （原始内容存档于2016-05-15）. ^ McMillian, Graeme. 'Captain America: Civil War' Will Be the Longest Marvel Studios Film to Date. The Hollywood Reporter. 2016-03-09 [2016-03-09]. （原始内容存档于2016-03-10）. 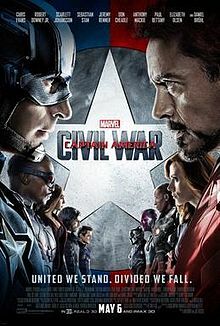 ^ 4.0 4.1 4.2 Captain America: Civil War (2016). Box Office Mojo. [2016-09-04]. ^ Irish Examiner. That Irish accent in Avengers Age of Ultron is actress Kerry Condon!. 2015-04-23 [2016-05-03]. ^ 9.0 9.1 Kroll, Justin. ‘Captain America 3′ Takes Shape at Marvel (Exclusive). Variety. 2014-01-21 [2014-01-21]. （原始内容存档于2014-01-28）. ^ Weintraub, Steve. Directors Joe & Anthony Russo Confirm They'll Direct Captain America 3; Say They're Breaking the Story Now with Screenwriters Christopher Markus & Stephen McFeely. Collider. 2014-03-11 [2014-03-14]. （原始内容存档于2014-03-11）. ^ Weinraub, Steve. Screenwriters Christopher Markus and Stephen McFeely Talk Captain America 3; Reveal They've Been Working on it Since Late 2013. Collider. 2014-04-07 [2014-04-07]. （原始内容存档于2014-04-07）. ^ Chitwood, Adam. CAPTAIN AMERICA 3 Directors Joe and Anthony Russo Talk Filming Dates, the Title, the Evolution of the Script, Marvel's Involvement, Hawkeye, and More. Collider. 2014-08-27 [2014-08-27]. （原始内容存档于2014-08-28）. ^ Goldman, Eric. Captain America 3 Directors On Making Sure The Next Sequel Offers Surprises. IGN. 2014-08-27 [2014-08-27]. （原始内容存档于2014-08-27）. ^ McIntyre, Gina. 'Captain America: Winter Soldier' inspired by 'Star Wars,' 'French Connection'. The Los Angeles Times. 2014-04-02 [2014-04-02]. （原始内容存档于2014-04-02）. ^ 15.0 15.1 Strom, Marc. Captain America to Return to Theaters May 6, 2016. Marvel. 2014-04-07 [2014-04-07]. （原始内容存档于2014-04-07）. ^ Gee, Dana. Lensman loves getting lost in the images from new Captain America film. The Province (British Columbia). 2014-04-21 [2014-04-21]. （原始内容存档于2014-04-21）. ^ What to Expect in Marvel's Agent Carter – Comic Con 2014. IGN. 事件发生在 8:45. 2014-07-25 [2014-07-26]. ^ Setchfield, Nick. Exclusive: Marvel Screenwriters Talk Winter Soldier And Captain America 3. SFX. 2014-08-13 [2014-08-16]. （原始内容存档于2014-08-16）. ^ 19.0 19.1 19.2 Lang, Brent. ‘Captain America: Civil War’ First to Use New Imax/Arri 2D Camera (EXCLUSIVE). Variety. 2015-04-13 [2015-04-13]. （原始内容存档于2015-04-13）. ^ Damore, Megan. Frank Grillo Teases Crossbones' "Captain America: Civil War" Appearance. Comic Book Resources. 2015-04-27 [2015-04-28]. （原始内容存档于2015-04-28）. ^ Brett, Jennifer. Extras casting call for "Captain America: Civil War". The Atlanta Journal-Constitution. 2015-03-13 [2015-03-14]. （原始内容存档于2015-03-15）. ^ Hensley, Ellie. "Captain America: Civil War" begins filming in Atlanta. Atlanta Business Journal. 2015-04-29 [2015-05-04]. （原始内容存档于2015-05-04）. ^ 23.0 23.1 Brett, Jennifer. Photos from the “Captain America: Civil War” set in Atlanta. Atlanta Journal-Constitution. 2015-05-11 [2015-05-12]. （原始内容存档于2015-05-12）. ^ Brett, Jennifer. Photos from the “Captain America: Civil War” set in Atlanta. Atlanta Journal-Constitution. 2015-05-13 [2015-05-14]. （原始内容存档于2015-05-14）. ^ Brett, Jennifer. PHOTOS: Chris Evans on the Atlanta “Captain America” set. Atlanta Journal-Constitution. 2015-05-15 [2015-05-15]. （原始内容存档于2015-05-15）. ^ B-96 Chicago. Kevin Costner & Anthony Mackie Talk "Black or White". YouTube. 事件发生在 9:45. 2015-01-09 [2015-01-10]. ^ Babbage, Rachel. Captain America: Civil War to start shooting in two weeks. Digital Spy. 2015-03-21 [2015-04-01]. （原始内容存档于2015-04-01）. ^ Han, Angie. ‘Star Wars: Rogue One’, ‘Captain America: Civil War’, and More Get IMAX Releases. /Film. 2015-04-08 [2015-04-08]. （原始内容存档于2015-04-08）. ^ Graser, Marc. TNT Locks Down Next Five Marvel Movies Starting With 'The Avengers: Age of Ultron'. Variety. 2014-09-17 [2014-09-17]. （原始内容存档于2014-09-18）. ^ The First ‘Captain America: Civil War’ Trailer Is Here. slashfilm. 2015年11月24日. ^ Marvel's Captain America: Civil War - Trailer 2. Youtube. 2016年3月10日. ^ Captain America: Civil War (2016). Rotten Tomatoes. [2016-10-17]. ^ Captain America: Civil War. Metacritic (CBS Interactive). [2016-05-05]. ^ D'Alessandro, Anthony. Why ‘Captain America: Civil War’ Is Poised To Be This Summer’s Top-Grossing Live-Action Film: B.O. Postmortem. Deadline.com. 2016-05-09 [2016-05-10]. （原始内容存档于2016-05-10）. ^ Busch, Anita. ‘Captain America: Civil War’ Crosses $200M Stateside And Passes ‘Winter Soldier’ Globally; ‘Jungle Book’ On Verge Of Crossing $300M Domestic, $500M Int’l. Deadline.com. 2016-05-11 [2016-05-11]. （原始内容存档于2016-05-11）. ^ McNary, Dave. ‘Captain America: Civil War’ Becomes Biggest Movie of the Year Worldwide. Variety. 2016-05-19 [2016-05-19]. （原始内容存档于2016-05-19）. ^ Tartaglione, Nancy. ‘X-Men: Apocalypse’ Dawns With $101.5M; ‘Angry Birds’ Sings With $55.5M, ‘Zootopia’ #4 Animated Pic Ever Worldwide – Intl Box Office Final. Deadline.com. 2016-05-23 [2016-05-23]. （原始内容存档于2016-05-24）. ^ 賀靜賢. 吸金猛！《美國隊長3》登台5天賣翻 《復仇者2》讓位. 自由時報. 2016-05-02. ^ 蜘蛛仔嫩贏美國隊長. 東方日報 (香港). 2016年4月14日. ^ Teen Choice Awards 2016—Captain America: Civil War Leads Second Wave of Nominations. E! Online. 2016-06-09. ^ People’s Choice Awards Nominees 2017 — Full List. Deadline. 2016-11-15 [2016-11-15].